- Soprano Sax on "A Pharaoh's Dream"
Since it arrived with virtually no advance warning, Standing In The Light may already have been dismissed as just another "electro-pop" offering from the U.K. But Level 42 is too good for that sort of idle appraisal: this smart, soulful group whose music grows on you with each listen. 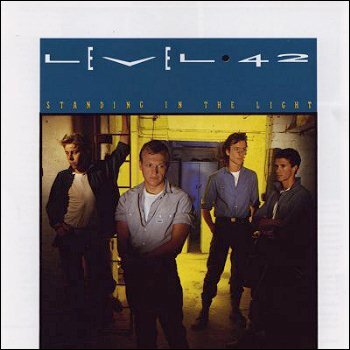 In some respects Level 42 is reminiscent of the Average White Band: all the songs are danceable and there is a certain sexiness in both the vocals (keyboardist Mike Lindup and bassist mark King share the leads) and the jivestepping arrangements. But Level 42's funk is not as rich as AWB's was, and there are no horns to ice the cake. Level 42 is more of a synthesized '80s confection: less calories, yet as sweet as can be. If there's a hit single on this album, the album opening "Micro-Kid" is it. An anthem for the whiz-kids of the world, "Micro-Kid' is catchy. peppy, hooky--all the adjectives that usually apply to singles in this genre. Where micro-kids can escape the real world through their computer, the rest of the population might consider dancing its troubles away, as suggested in "Dance On Heavy Weather." When Level 42 urges us to "take a chance and dance", you'll probably laugh out loud at the hackneyed sentiment - but isn't this more or less what most dance songs are saying these days? "I Want Eyes," a haunting ballad with an inscrutable punch line, also attempts to deal with our contemporary crisis: "I saw it in the news today/A thousand lives just blown away/I want eyes." Say wha? (Of course, I must confess to not understanding the meaning of "miss me blind," either). But credit should at least be given to Level 42 for trying to say something, and the dream-like setting for the song justifies its ambiguity. It should be noted that Standing In The Light is impeccably produced, thanks to Earth, Wind and Fire veterans verdine White and Larry Dunn, who "discovered" the band in England last year. Suprisingly, there are no hallmark Earth, Wind and Fire touches on the record, and only EW&F sax man Andrew Woolfolk makes a brief appearance. Otherwise, Lindup, King and the Gould Brothers - Phil on drums and Boon on guitar - do all the work. And to be perfectly honest, they don't need much help. Level 42 works on their own.